I usually keep a little net bag of small potatoes around, since they are easy to roast for a worknight dinner. Or I’ll roast them on Sunday, and use them up during the week. Usually I toss them with olive oil, garlic, and rosemary, but this time I tried something different, lemon zest and thyme (and olive oil, of course). I even had parsley on hand for a change, to sprinkle on them at the end, and they were delicious. That night, I had them with broiled salmon (and peas I think). Later in the week, I used them up with other things. 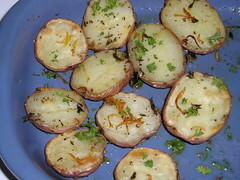 These were the little buttery yellow-fleshed potatoes, and that creamy texture seemed perfect with the lemon. I peeled the rind and slivered it with a knife, as I thought grating it on my microplane would result in bits of peel that were too thin to hold up to the roasting (at 350 for about 45 minutes I think). Once they were done, you still knew there was lemon rind in there. potatoes sound delicious – must try that soon now that fall is here and I won’t mind turning on the oven. Eggplant with chocolate? I wonder how my Romanian ancesters would take to that? Worth a try.